Molten Salt is self-descriptive; it is melted salts, another common name is Fused Salts. It is a salt that tends to be a solid (under standard temperature and pressure conditions) but becomes a liquid at elevated temperatures. The simplest example of a molten salt would be to heat sodium chloride (“table salt”) to a red heat (greater than 801° C, or 1474° F) upon which it would melt into a liquid. An important feature of molten salts is that they exhibit the ability to conduct electricity, which makes them a suitable choice for use in generating electricity from renewable sources, such as solar or from nuclear energy. Apart from the substantial advantages of molten salts in industry, they tend to contribute to general corrosion of infrastructure. Salts of binary, ternary, and higher-order systems have (generally known) phase diagrams and thermodynamic descriptions similar to metallic systems. More recently, organic-based fused salts, which generally also provide liquids at a lower temperature range, have been included as fused salts under the label ‘ionic liquids’. Molten salts are compatible with structural alloys. As a result, the possibility of oxidation of structural metal into corresponding fluorides and chlorides with a corresponding reduction of an oxidizing agent is always there. Since molten salts are ionic and good conductors of electricity, oxidation reactions (corrosion) will occur readily and the structural materials can undergo either uniform surface corrosion, galvanic corrosion, pitting corrosion or intergranular corrosion. 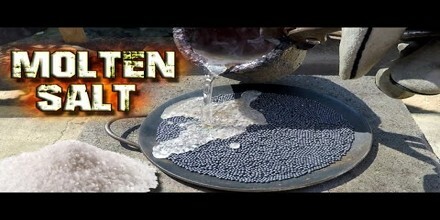 One of the interesting features of molten salts is their ability to conduct electricity. For example, solid sodium chloride (NaCl, or table salt) does not conduct electricity; it is an insulator. If NaCl is placed into water, the mutual attraction both sodium (Na) and chlorine (Cl) have for water molecules cause their bonds to break (dissolving) and form ions within the water. These electrically charged ions can conduct electricity if there is a voltage potential (electric field). 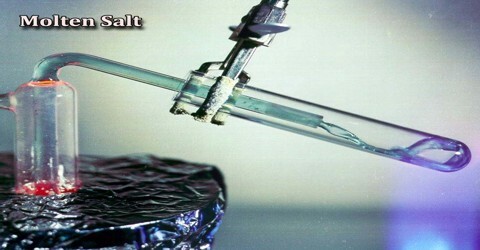 The first commercial application of electrolytic molten salt technology was the development of the Hall-Héroult electrolytic process for producing aluminum metal in 1886, but the British chemist Sir Humphry Davy had performed the basic experiment in 1809!3 So, as you can see, molten salt technology has been around for almost 200 years. Molten salts conduct electricity the same way they do when they are dissolved in water; some of the salt molecules are dissociated into ions, which allows the ions to conduct electricity. The “Downs Cell” capitalizes on this conduction of electricity to produce virtually all of the metallic sodium required by industry. Electricity is run through molten sodium chloride, with a little calcium chloride salt added to lower the melting point of the sodium chloride. At one terminal chlorine gas is released (the anode) and at the other (the cathode) liquid sodium. 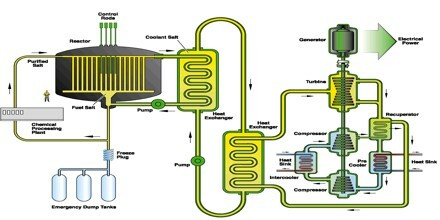 The most interesting application of molten salt technology was the development of the Molten Salt (Nuclear) Reactor (MSR). Originally developed to power a deep penetration bomber for targets in the Soviet Union during the early Cold War (1946 – 1962)4, it is a remarkable, yet virtually unknown reactor. Part of the problem was the limited geographical experience of the MSR as both operating MSRs were built only at Oak Ridge National Laboratory (ORNL), near Knoxville, Tennessee, US. Molten Salt is also used to quench, annel, and temper steel. Molten salt can also be used to enhance the natural properties of metal, or even to alter the surface finish. This liquid salt is used to anodize aluminum, for example, or to enhance the strength and corrosion-resistance of other metal alloys. A commonly used thermal salt is the eutectic mixture of 60% sodium nitrate and 40% potassium nitrate, which can be used as liquid between 260-550 °C. It has a heat of fusion of 161 J/g, and a heat capacity of 1.53 J/(g K). Experimental salts using lithium may have a melting point of 116 °C while still having a heat capacity of 1.54 J/(g K). Salts may cost $1,000 per ton, and a typical plant may use 30,000 tons of salt. It is also plays an important role in modern energy production, and may allow power plants to utilize solar energy even when the sun isn’t shining. 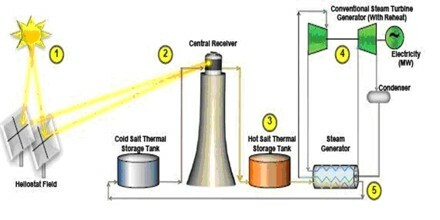 Solar facilities use large mirrors or solar panels to heat a large tub or tower filled with a molten salt mixture. 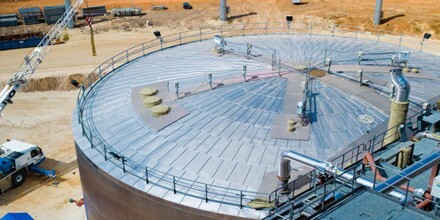 This mixture naturally stores heat energy, which is pumped to a nearby steam generator. This generator powers an electrical turbine to produce clean, eco-friendly electricity. The natural properties of molten salt allow it to store heat energy for many hours, which means that these plants can produce electricity round the clock using this technology.